Every building which is classified by WorkSafeBC as a workplace must have an inventory conducted of all asbestos containing materials. Many building owners and managers also wish to know where other harmful substances such as Lead, PCBs Mercury are located. Some buildings which might not immediately be recognized as workplaces would include apartment buildings or condominiums if staff are employed for maintenance or custodial duties. The inventory must be conducted by a qualified person and should not only identify the hazardous materials, but their potential risk to occupants must be assessed taking into account their location and condition. The inventory must be kept up to date (usually on an annual basis). The Apex EHS team have conducted management surveys on hundreds of properties ranging from small pump houses to large civic buildings. 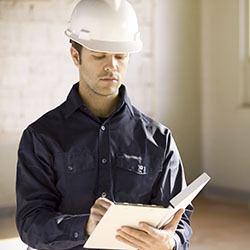 Whether you are responsible for a single building such as an office, shop or apartment building or are responsible for multiple buildings such as a municipal portfolio manager or School District Apex EHS can help you fulfill your responsibilities. We have developed state of the art software and data collection and management systems which can enable our clients keep their inventory continuously up to date, or we can simply provide a paper report and drawing of the building indicating where the hazardous materials may be found and a labelling system to prevent accidental disturbance.